As mentioned in Using the Tracing System, the whole point of running an ns-3 simulation is to generate output for study. You have two basic strategies to obtain output from ns-3: using generic pre-defined bulk output mechanisms and parsing their content to extract interesting information; or somehow developing an output mechanism that conveys exactly (and perhaps only) the information wanted. Using pre-defined bulk output mechanisms has the advantage of not requiring any changes to ns-3, but it may require writing scripts to parse and filter for data of interest. Often, PCAP or NS_LOG output messages are gathered during simulation runs and separately run through scripts that use grep, sed or awk to parse the messages and reduce and transform the data to a manageable form. Programs must be written to do the transformation, so this does not come for free. NS_LOG output is not considered part of the ns-3 API, and can change without warning between releases. In addition, NS_LOG output is only available in debug builds, so relying on it imposes a performance penalty. Of course, if the information of interest does not exist in any of the pre-defined output mechanisms, this approach fails. If you need to add some tidbit of information to the pre-defined bulk mechanisms, this can certainly be done; and if you use one of the ns-3 mechanisms, you may get your code added as a contribution. ns-3 provides another mechanism, called Tracing, that avoids some of the problems inherent in the bulk output mechanisms. It has several important advantages. First, you can reduce the amount of data you have to manage by only tracing the events of interest to you (for large simulations, dumping everything to disk for post-processing can create I/O bottlenecks). Second, if you use this method, you can control the format of the output directly so you avoid the postprocessing step with sed, awk, perl or python scripts. If you desire, your output can be formatted directly into a form acceptable by gnuplot, for example (see also GnuplotHelper). You can add hooks in the core which can then be accessed by other users, but which will produce no information unless explicitly asked to do so. For these reasons, we believe that the ns-3 tracing system is the best way to get information out of a simulation and is also therefore one of the most important mechanisms to understand in ns-3. Nobody is going to prevent you from going deep into the core of ns-3 and adding print statements. This is insanely easy to do and, after all, you have complete control of your own ns-3 branch. This will probably not turn out to be very satisfactory in the long term, though. As the number of print statements increases in your programs, the task of dealing with the large number of outputs will become more and more complicated. Eventually, you may feel the need to control what information is being printed in some way, perhaps by turning on and off certain categories of prints, or increasing or decreasing the amount of information you want. If you continue down this path you may discover that you have re-implemented the NS_LOG mechanism (see Using the Logging Module). In order to avoid that, one of the first things you might consider is using NS_LOG itself. We mentioned above that one way to get information out of ns-3 is to parse existing NS_LOG output for interesting information. If you discover that some tidbit of information you need is not present in existing log output, you could edit the core of ns-3 and simply add your interesting information to the output stream. Now, this is certainly better than adding your own print statements since it follows ns-3 coding conventions and could potentially be useful to other people as a patch to the existing core. This may seem fairly simple and satisfying at first glance, but something to consider is that you will be writing code to add NS_LOG statements and you will also have to write code (as in grep, sed or awk scripts) to parse the log output in order to isolate your information. This is because even though you have some control over what is output by the logging system, you only have control down to the log component level, which is typically an entire source code file. If you are adding code to an existing module, you will also have to live with the output that every other developer has found interesting. You may find that in order to get the small amount of information you need, you may have to wade through huge amounts of extraneous messages that are of no interest to you. You may be forced to save huge log files to disk and process them down to a few lines whenever you want to do anything. Since there are no guarantees in ns-3 about the stability of NS_LOG output, you may also discover that pieces of log output which you depend on disappear or change between releases. If you depend on the structure of the output, you may find other messages being added or deleted which may affect your parsing code. Finally, NS_LOG output is only available in debug builds, you can’t get log output from optimized builds, which run about twice as fast. Relying on NS_LOG imposes a performance penalty. For these reasons, we consider prints to std::cout and NS_LOG messages to be quick and dirty ways to get more information out of ns-3, but not suitable for serious work. It is desirable to have a stable facility using stable APIs that allow one to reach into the core system and only get the information required. It is desirable to be able to do this without having to change and recompile the core system. Even better would be a system that notified user code when an item of interest changed or an interesting event happened so the user doesn’t have to actively poke around in the system looking for things. The ns-3 tracing system is designed to work along those lines and is well-integrated with the Attribute and Config subsystems allowing for relatively simple use scenarios. The ns-3 tracing system is built on the concepts of independent tracing sources and tracing sinks, along with a uniform mechanism for connecting sources to sinks. Trace sources are entities that can signal events that happen in a simulation and provide access to interesting underlying data. For example, a trace source could indicate when a packet is received by a net device and provide access to the packet contents for interested trace sinks. A trace source might also indicate when an interesting state change happens in a model. For example, the congestion window of a TCP model is a prime candidate for a trace source. Every time the congestion window changes connected trace sinks are notified with the old and new value. Trace sources are not useful by themselves; they must be connected to other pieces of code that actually do something useful with the information provided by the source. The entities that consume trace information are called trace sinks. Trace sources are generators of data and trace sinks are consumers. This explicit division allows for large numbers of trace sources to be scattered around the system in places which model authors believe might be useful. Inserting trace sources introduces a very small execution overhead. There can be zero or more consumers of trace events generated by a trace source. One can think of a trace source as a kind of point-to-multipoint information link. Your code looking for trace events from a particular piece of core code could happily coexist with other code doing something entirely different from the same information. Unless a user connects a trace sink to one of these sources, nothing is output. By using the tracing system, both you and other people hooked to the same trace source are getting exactly what they want and only what they want out of the system. Neither of you are impacting any other user by changing what information is output by the system. If you happen to add a trace source, your work as a good open-source citizen may allow other users to provide new utilities that are perhaps very useful overall, without making any changes to the ns-3 core. Let’s take a few minutes and walk through a simple tracing example. We are going to need a little background on Callbacks to understand what is happening in the example, so we have to take a small detour right away. The goal of the Callback system in ns-3 is to allow one piece of code to call a function (or method in C++) without any specific inter-module dependency. This ultimately means you need some kind of indirection – you treat the address of the called function as a variable. This variable is called a pointer-to-function variable. The relationship between function and pointer-to-function is really no different that that of object and pointer-to-object. This looks like you are calling a function named pfi, but the compiler is smart enough to know to call through the variable pfi indirectly to the function MyFunction. Conceptually, this is almost exactly how the tracing system works. Basically, a trace sink is a callback. When a trace sink expresses interest in receiving trace events, it adds itself as a Callback to a list of Callbacks internally held by the trace source. When an interesting event happens, the trace source invokes its operator(...) providing zero or more arguments. The operator(...) eventually wanders down into the system and does something remarkably like the indirect call you just saw, providing zero or more parameters, just as the call to pfi above passed one parameter to the target function MyFunction. The important difference that the tracing system adds is that for each trace source there is an internal list of Callbacks. Instead of just making one indirect call, a trace source may invoke multiple Callbacks. When a trace sink expresses interest in notifications from a trace source, it basically just arranges to add its own function to the callback list. If you are interested in more details about how this is actually arranged in ns-3, feel free to peruse the Callback section of the ns-3 Manual. Most of this code should be quite familiar to you. As mentioned above, the trace system makes heavy use of the Object and Attribute systems, so you will need to include them. The first two includes above bring in the declarations for those systems explicitly. You could use the core module header to get everything at once, but we do the includes explicitly here to illustrate how simple this all really is. The file, traced-value.h brings in the required declarations for tracing of data that obeys value semantics. In general, value semantics just means that you can pass the object itself around, rather than passing the address of the object. What this all really means is that you will be able to trace all changes made to a TracedValue in a really simple way. Since the tracing system is integrated with Attributes, and Attributes work with Objects, there must be an ns-3 Object for the trace source to live in. The next code snippet declares and defines a simple Object we can work with. The two important lines of code, above, with respect to tracing are the .AddTraceSource and the TracedValue declaration of m_myInt. All trace sinks hooking this trace source must have this signature. We’ll discuss below how you can determine the required callback signature in other cases. This is the definition of a matching trace sink. It corresponds directly to the callback function signature. Once it is connected, this function will be called whenever the TracedValue changes. Here we first create the MyObject instance in which the trace source lives. The next step, the TraceConnectWithoutContext, forms the connection between the trace source and the trace sink. The first argument is just the trace source name “MyInteger” we saw above. Notice the MakeCallback template function. This function does the magic required to create the underlying ns-3 Callback object and associate it with the function IntTrace. TraceConnect makes the association between your provided function and overloaded operator() in the traced variable referred to by the “MyInteger” Attribute. After this association is made, the trace source will “fire” your provided callback function. The code to make all of this happen is, of course, non-trivial, but the essence is that you are arranging for something that looks just like the pfi() example above to be called by the trace source. The declaration of the TracedValue<int32_t> m_myInt; in the Object itself performs the magic needed to provide the overloaded assignment operators that will use the operator() to actually invoke the Callback with the desired parameters. The .AddTraceSource performs the magic to connect the Callback to the Config system, and TraceConnectWithoutContext performs the magic to connect your function to the trace source, which is specified by Attribute name. Let’s ignore the bit about context for now. should be interpreted as an invocation of operator= on the member variable m_myInt with the integer 1234 passed as a parameter. Since m_myInt is a TracedValue, this operator is defined to execute a callback that returns void and takes two integer values as parameters — an old value and a new value for the integer in question. That is exactly the function signature for the callback function we provided — IntTrace. To summarize, a trace source is, in essence, a variable that holds a list of callbacks. A trace sink is a function used as the target of a callback. The Attribute and object type information systems are used to provide a way to connect trace sources to trace sinks. The act of “hitting” a trace source is executing an operator on the trace source which fires callbacks. This results in the trace sink callbacks who registering interest in the source being called with the parameters provided by the source. When we executed the code, myObject->m_myInt = 1234;, the trace source fired and automatically provided the before and after values to the trace sink. The function IntTrace then printed this to the standard output. The TraceConnectWithoutContext call shown above in the simple example is actually very rarely used in the system. More typically, the Config subsystem is used to select a trace source in the system using what is called a Config path. We saw an example of this in the previous section where we hooked the “CourseChange” event when we were experimenting with third.cc. It turns out that the internal code for Config::ConnectWithoutContext and Config::Connect actually find a Ptr<Object> and call the appropriate TraceConnect method at the lowest level. The Config functions take a path that represents a chain of Object pointers. Each segment of a path corresponds to an Object Attribute. The last segment is the Attribute of interest, and prior segments must be typed to contain or find Objects. The Config code parses and “walks” this path until it gets to the final segment of the path. It then interprets the last segment as an Attribute on the last Object it found while walking the path. The Config functions then call the appropriate TraceConnect or TraceConnectWithoutContext method on the final Object. Let’s see what happens in a bit more detail when the above path is walked. The leading “/” character in the path refers to a so-called namespace. One of the predefined namespaces in the config system is “NodeList” which is a list of all of the nodes in the simulation. Items in the list are referred to by indices into the list, so “/NodeList/7” refers to the eighth Node in the list of nodes created during the simulation (recall indices start at 0’). This reference is actually a ``Ptr<Node>` and so is a subclass of an ns3::Object. As described in the Object Model section of the ns-3 Manual, we make widespread use of object aggregation. This allows us to form an association between different Objects without building a complicated inheritance tree or predeciding what objects will be part of a Node. Each Object in an Aggregation can be reached from the other Objects. which should look very familiar at this point. Derived classes will call into this method whenever they do a course change to support tracing. This method invokes operator() on the underlying m_courseChangeTrace, which will, in turn, invoke all of the registered Callbacks, calling all of the trace sinks that have registered interest in the trace source by calling a Config function. So, in the third.cc example we looked at, whenever a course change is made in one of the RandomWalk2dMobilityModel instances installed, there will be a NotifyCourseChange() call which calls up into the MobilityModel base class. As seen above, this invokes operator() on m_courseChangeTrace, which in turn, calls any registered trace sinks. In the example, the only code registering an interest was the code that provided the Config path. Therefore, the CourseChange function that was hooked from Node number seven will be the only Callback called. The first part of the output is the context. It is simply the path through which the config code located the trace source. In the case we have been looking at there can be any number of trace sources in the system corresponding to any number of nodes with mobility models. There needs to be some way to identify which trace source is actually the one that fired the Callback. The easy way is to connect with Config::Connect, instead of Config::ConnectWithoutContext. Okay, I know that there must be trace sources in the simulation core, but how do I find out what trace sources are available to me? The answer to the first question is found in the ns-3 API documentation. If you go to the project web site, ns-3 project, you will find a link to “Documentation” in the navigation bar. If you select this link, you will be taken to our documentation page. There is a link to “Latest Release” that will take you to the documentation for the latest stable release of ns-3. If you select the “API Documentation” link, you will be taken to the ns-3 API documentation page. The list of interest to us here is “All TraceSources”. Go ahead and select that link. You will see, perhaps not too surprisingly, a list of all of the trace sources available in ns-3. You should recognize this as the trace source we used in the third.cc example. Perusing this list will be helpful. Okay, I found a trace source, how do I figure out the Config path to use when I connect to it? Config Paths: a list of typical Config paths for this class. Attributes: a list of all attributes supplied by this class. TraceSources: a list of all TraceSources available from this class. First we’ll discuss the Config paths. Let’s assume that you have just found the “CourseChange” trace source in the “All TraceSources” list and you want to figure out how to connect to it. You know that you are using (again, from the third.cc example) an ns3::RandomWalk2dMobilityModel. So either click on the class name in the “All TraceSources” list, or find ns3::RandomWalk2dMobilityModel in the “Class List”. Either way you should now be looking at the “ns3::RandomWalk2dMobilityModel Class Reference” page. The difference is due to the fact that two GetObject calls are implied in the string found in the documentation. The first, for $ns3::MobilityModel will query the aggregation for the base class. The second implied GetObject call, for $ns3::RandomWalk2dMobilityModel, is used to cast the base class to the concrete implementation class. The documentation shows both of these operations for you. It turns out that the actual trace source you are looking for is found in the base class. CourseChange: The value of the position and/or velocity vector changed. We’ll return to this example in a moment. Okay, I found a trace source and the Config path, how do I figure out what the return type and formal arguments of my callback function need to be? The easiest way is to examine the callback signature typedef, which is given in the “Callback signature” of the trace source in the “Detailed Description” for the class, as shown above. TracedCallback signature for course change notifications. If the callback is connected using ConnectWithoutContext omit the context argument from the signature. [in] context The context string supplied by the Trace source. [in] model The MobilityModel which is changing course. Has the MobilityModel supplied as the last argument (or only argument if ConnectWithoutContext is used). If, by chance, the callback signature hasn’t been documented, and there are no examples to work from, determining the right callback function signature can be, well, challenging to actually figure out from the source code. which is exactly what we used in the third.cc example. This section is entirely optional. It is going to be a bumpy ride, especially for those unfamiliar with the details of templates. However, if you get through this, you will have a very good handle on a lot of the ns-3 low level idioms. So, again, let’s figure out what signature of callback function is required for the “CourseChange” trace source. This is going to be painful, but you only need to do this once. After you get through this, you will be able to just look at a TracedCallback and understand it. This declaration is for a template. The template parameter is inside the angle-brackets, so we are really interested in finding out what that TracedCallback<> is. If you have absolutely no idea where this might be found, grep is your friend. You’ll see 303 lines fly by (I piped this through wc to see how bad it was). Although that may seem like a lot, that’s not really a lot. Just pipe the output through more and start scanning through it. On the first page, you will see some very suspiciously template-looking stuff. Of course, you could have gone at this from the other direction and started by looking at the includes in mobility-model.h and noticing the include of traced-callback.h and inferring that this must be the file you want. In either case, the next step is to take a look at src/core/model/traced-callback.h in your favorite editor to see what is happening. An ns3::TracedCallback has almost exactly the same API as a normal ns3::Callback but instead of forwarding calls to a single function (as an ns3::Callback normally does), it forwards calls to a chain of ns3::Callback. This should sound very familiar and let you know you are on the right track. You are now in the belly of the beast. When the template is instantiated for the declaration above, the compiler will replace T1 with Ptr<const MobilityModel>. You can now see the implementation of everything we’ve been talking about. The code creates a Callback of the right type and assigns your function to it. This is the equivalent of the pfi = MyFunction we discussed at the start of this section. The code then adds the Callback to the list of Callbacks for this source. The only thing left is to look at the definition of Callback. Using the same grep trick as we used to find TracedCallback, you will be able to find that the file ./core/callback.h is the one we need to look at. the first non-optional template argument represents the return type of the callback. the remaining (optional) template arguments represent the type of the subsequent arguments to the callback. up to nine arguments are supported. declaration means. Now we are in a position to understand that the first (non-optional) template argument, void, represents the return type of the Callback. The second (optional) template argument, Ptr<const MobilityModel> represents the type of the first argument to the callback. which is exactly what we used in the third.cc example. Perhaps you should now go back and reread the previous section (Take My Word for It). If you are interested in more details regarding the implementation of Callbacks, feel free to take a look at the ns-3 manual. They are one of the most frequently used constructs in the low-level parts of ns-3. It is, in my opinion, a quite elegant thing. Earlier in this section, we presented a simple piece of code that used a TracedValue<int32_t> to demonstrate the basics of the tracing code. We just glossed over the what a TracedValue really is and how to find the return type and formal arguments for the callback. What this all really means is that you will be able to trace all changes made using those operators to a C++ object which has value semantics. The .AddTraceSource in the GetTypeId method provides the “hooks” used for connecting the trace source to the outside world through the Config system. We already discussed the first three arguments to AddTraceSource: the Attribute name for the Config system, a help string, and the address of the TracedValue class data member. The final string argument, “ns3::TracedValueCallback::Int32” in the example, is the name of a typedef for the callback function signature. We require these signatures to be defined, and give the fully qualified type name to AddTraceSource, so the API documentation can link a trace source to the function signature. For TracedValue the signature is straightforward; for TracedCallbacks we’ve already seen the API docs really help. Let’s do an example taken from one of the best-known books on TCP around. “TCP/IP Illustrated, Volume 1: The Protocols,” by W. Richard Stevens is a classic. I just flipped the book open and ran across a nice plot of both the congestion window and sequence numbers versus time on page 366. Stevens calls this, “Figure 21.10. Value of cwnd and send sequence number while data is being transmitted.” Let’s just recreate the cwnd part of that plot in ns-3 using the tracing system and gnuplot. You will find page after page of instances of tcp pointing you to that file. You should now understand this code completely. If we have a pointer to the TcpSocketBase object, we can TraceConnect to the “CongestionWindow” trace source if we provide an appropriate callback target. This is the same kind of trace source that we saw in the simple example at the start of this section, except that we are talking about uint32_t instead of int32_t. And we know that we have to provide a callback function with that signature. This will point out a couple of promising candidates: examples/tcp/tcp-large-transfer.cc and src/test/ns3tcp/ns3tcp-cwnd-test-suite.cc. This should look very familiar to you. We mentioned above that if we had a pointer to the TcpSocketBase, we could TraceConnect to the “CongestionWindow” trace source. That’s exactly what we have here; so it turns out that this line of code does exactly what we want. Let’s go ahead and extract the code we need from this function (Ns3TcpCwndTestCase1::DoRun (void)). If you look at this function, you will find that it looks just like an ns-3 script. It turns out that is exactly what it is. It is a script run by the test framework, so we can just pull it out and wrap it in main instead of in DoRun. Rather than walk through this, step, by step, we have provided the file that results from porting this test back to a native ns-3 script – examples/tutorial/fifth.cc. The fifth.cc example demonstrates an extremely important rule that you must understand before using any kind of trace source: you must ensure that the target of a Config::Connect command exists before trying to use it. This is no different than saying an object must be instantiated before trying to call it. Although this may seem obvious when stated this way, it does trip up many people trying to use the system for the first time. Let’s return to basics for a moment. There are three basic execution phases that exist in any ns-3 script. The first phase is sometimes called “Configuration Time” or “Setup Time,” and exists during the period when the main function of your script is running, but before Simulator::Run is called. The second phase is sometimes called “Simulation Time” and exists during the time period when Simulator::Run is actively executing its events. After it completes executing the simulation, Simulator::Run will return control back to the main function. When this happens, the script enters what can be called the “Teardown Phase,” which is when the structures and objects created during setup are taken apart and released. Perhaps the most common mistake made in trying to use the tracing system is assuming that entities constructed dynamically during simulation time are available during configuration time. In particular, an ns-3 Socket is a dynamic object often created by Applications to communicate between Nodes. An ns-3 Application always has a “Start Time” and a “Stop Time” associated with it. In the vast majority of cases, an Application will not attempt to create a dynamic object until its StartApplication method is called at some “Start Time”. This is to ensure that the simulation is completely configured before the app tries to do anything (what would happen if it tried to connect to a Node that didn’t exist yet during configuration time?). As a result, during the configuration phase you can’t connect a trace source to a trace sink if one of them is created dynamically during the simulation. Create the dynamic object at configuration time, hook it then, and give the object to the system to use during simulation time. We took the second approach in the fifth.cc example. This decision required us to create the MyApp Application, the entire purpose of which is to take a Socket as a parameter. This has all been covered, so we won’t rehash it. The next lines of source are the network illustration and a comment addressing the problem described above with Socket. // couldn't get at it. // a little more involved in the details, but this is trivial. // install in the source node. This should also be self-explanatory. The next part is the declaration of the MyApp Application that we put together to allow the Socket to be created at configuration time. You can see that this class inherits from the ns-3 Application class. Take a look at src/network/model/application.h if you are interested in what is inherited. The MyApp class is obligated to override the StartApplication and StopApplication methods. These methods are automatically called when MyApp is required to start and stop sending data during the simulation. It is worthwhile to spend a bit of time explaining how events actually get started in the system. This is another fairly deep explanation, and can be ignored if you aren’t planning on venturing down into the guts of the system. It is useful, however, in that the discussion touches on how some very important parts of ns-3 work and exposes some important idioms. If you are planning on implementing new models, you probably want to understand this section. as a result of the apps.Stop call. The ultimate result of these calls is that we want to have the simulator automatically make calls into our Applications to tell them when to start and stop. In the case of MyApp, it inherits from class Application and overrides StartApplication, and StopApplication. These are the functions that will be called by the simulator at the appropriate time. In the case of MyApp you will find that MyApp::StartApplication does the initial Bind, and Connect on the socket, and then starts data flowing by calling MyApp::SendPacket. MyApp::StopApplication stops generating packets by cancelling any pending send events then closes the socket. One of the nice things about ns-3 is that you can completely ignore the implementation details of how your Application is “automagically” called by the simulator at the correct time. But since we have already ventured deep into ns-3 already, let’s go for it. If you look at src/network/model/application.cc you will find that the SetStartTime method of an Application just sets the member variable m_startTime and the SetStopTime method just sets m_stopTime. From there, without some hints, the trail will probably end. The key to picking up the trail again is to know that there is a global list of all of the nodes in the system. Whenever you create a node in a simulation, a pointer to that Node is added to the global NodeList. This tells you that whenever a Node is created in a simulation, as a side-effect, a call to that node’s Initialize method is scheduled for you that happens at time zero. Don’t read too much into that name, yet. It doesn’t mean that the Node is going to start doing anything, it can be interpreted as an informational call into the Node telling it that the simulation has started, not a call for action telling the Node to start doing something. So, NodeList::Add indirectly schedules a call to Node::Initialize at time zero to advise a new Node that the simulation has started. If you look in src/network/model/node.h you will, however, not find a method called Node::Initialize. It turns out that the Initialize method is inherited from class Object. All objects in the system can be notified when the simulation starts, and objects of class Node are just one kind of those objects. Take a look at src/core/model/object.cc next and search for Object::Initialize. This code is not as straightforward as you might have expected since ns-3 Objects support aggregation. The code in Object::Initialize then loops through all of the objects that have been aggregated together and calls their DoInitialize method. This is another idiom that is very common in ns-3, sometimes called the “template design pattern.”: a public non-virtual API method, which stays constant across implementations, and that calls a private virtual implementation method that is inherited and implemented by subclasses. The names are typically something like MethodName for the public API and DoMethodName for the private API. This tells us that we should look for a Node::DoInitialize method in src/network/model/node.cc for the method that will continue our trail. If you locate the code, you will find a method that loops through all of the devices in the Node and then all of the applications in the Node calling device->Initialize and application->Initialize respectively. This has been another fairly long journey, but it only has to be made once, and you now understand another very deep piece of ns-3. The existence of the next bit of code is the whole reason why we wrote this Application in the first place. This code should be pretty self-explanatory. We are just initializing member variables. The important one from the perspective of tracing is the Ptr<Socket> socket which we needed to provide to the application during configuration time. Recall that we are going to create the Socket as a TcpSocket (which is implemented by TcpSocketBase) and hook its “CongestionWindow” trace source before passing it to the Setup method. The above code is the overridden implementation Application::StartApplication that will be automatically called by the simulator to start our Application running at the appropriate time. You can see that it does a Socket Bind operation. If you are familiar with Berkeley Sockets this shouldn’t be a surprise. It performs the required work on the local side of the connection just as you might expect. The following Connect will do what is required to establish a connection with the TCP at Address m_peer. It should now be clear why we need to defer a lot of this to simulation time, since the Connect is going to need a fully functioning network to complete. After the Connect, the Application then starts creating simulation events by calling SendPacket. The next bit of code explains to the Application how to stop creating simulation events. Every time a simulation event is scheduled, an Event is created. If the Event is pending execution or executing, its method IsRunning will return true. In this code, if IsRunning() returns true, we Cancel the event which removes it from the simulator event queue. By doing this, we break the chain of events that the Application is using to keep sending its Packets and the Application goes quiet. After we quiet the Application we Close the socket which tears down the TCP connection. The socket is actually deleted in the destructor when the m_socket = 0 is executed. This removes the last reference to the underlying Ptr<Socket> which causes the destructor of that Object to be called. Recall that StartApplication called SendPacket to start the chain of events that describes the Application behavior. Here, you see that SendPacket does just that. It creates a Packet and then does a Send which, if you know Berkeley Sockets, is probably just what you expected to see. It is the responsibility of the Application to keep scheduling the chain of events, so the next lines call ScheduleTx to schedule another transmit event (a SendPacket) until the Application decides it has sent enough. Here, you see that ScheduleTx does exactly that. If the Application is running (if StopApplication has not been called) it will schedule a new event, which calls SendPacket again. The alert reader will spot something that also trips up new users. The data rate of an Application is just that. It has nothing to do with the data rate of an underlying Channel. This is the rate at which the Application produces bits. It does not take into account any overhead for the various protocols or channels that it uses to transport the data. If you set the data rate of an Application to the same data rate as your underlying Channel you will eventually get a buffer overflow. This should be very familiar to you now, so we won’t dwell on the details. This function just logs the current simulation time and the new value of the congestion window every time it is changed. 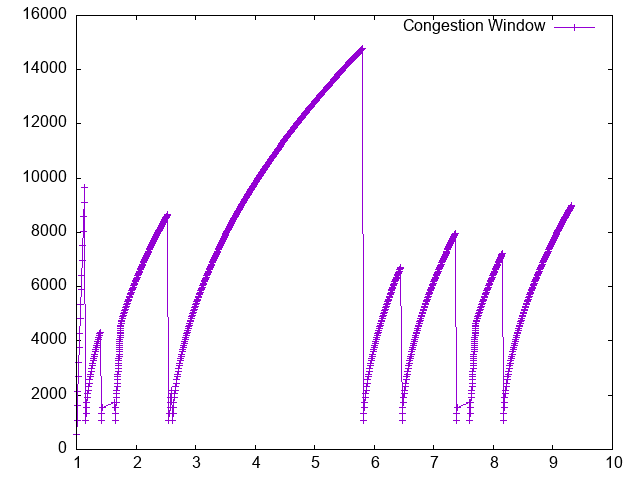 You can probably imagine that you could load the resulting output into a graphics program (gnuplot or Excel) and immediately see a nice graph of the congestion window behavior over time. We added a new trace sink to show where packets are dropped. We are going to add an error model to this code also, so we wanted to demonstrate this working. This trace sink will be connected to the “PhyRxDrop” trace source of the point-to-point NetDevice. This trace source fires when a packet is dropped by the physical layer of a NetDevice. If you take a small detour to the source (src/point-to-point/model/point-to-point-net-device.cc) you will see that this trace source refers to PointToPointNetDevice::m_phyRxDropTrace. If you then look in src/point-to-point/model/point-to-point-net-device.h for this member variable, you will find that it is declared as a TracedCallback<Ptr<const Packet> >. This should tell you that the callback target should be a function that returns void and takes a single parameter which is a Ptr<const Packet> (assuming we use ConnectWithoutContext) – just what we have above. This creates two nodes with a point-to-point channel between them, just as shown in the illustration at the start of the file. The next few lines of code show something new. If we trace a connection that behaves perfectly, we will end up with a monotonically increasing congestion window. To see any interesting behavior, we really want to introduce link errors which will drop packets, cause duplicate ACKs and trigger the more interesting behaviors of the congestion window. ns-3 provides ErrorModel objects which can be attached to Channels. We are using the RateErrorModel which allows us to introduce errors into a Channel at a given rate. The above code instantiates a RateErrorModel Object, and we set the “ErrorRate” Attribute to the desired value. We then set the resulting instantiated RateErrorModel as the error model used by the point-to-point NetDevice. This will give us some retransmissions and make our plot a little more interesting. The above code should be familiar. It installs internet stacks on our two nodes and creates interfaces and assigns IP addresses for the point-to-point devices. Since we are using TCP, we need something on the destination Node to receive TCP connections and data. The PacketSink Application is commonly used in ns-3 for that purpose. This code instantiates a PacketSinkHelper and tells it to create sockets using the class ns3::TcpSocketFactory. This class implements a design pattern called “object factory” which is a commonly used mechanism for specifying a class used to create objects in an abstract way. Here, instead of having to create the objects themselves, you provide the PacketSinkHelper a string that specifies a TypeId string used to create an object which can then be used, in turn, to create instances of the Objects created by the factory. The remaining parameter tells the Application which address and port it should Bind to. The next two lines of code will create the socket and connect the trace source. The first statement calls the static member function Socket::CreateSocket and provides a Node and an explicit TypeId for the object factory used to create the socket. This is a slightly lower level call than the PacketSinkHelper call above, and uses an explicit C++ type instead of one referred to by a string. Otherwise, it is conceptually the same thing. Once the TcpSocket is created and attached to the Node, we can use TraceConnectWithoutContext to connect the CongestionWindow trace source to our trace sink. The first line creates an Object of type MyApp – our Application. The second line tells the Application what Socket to use, what address to connect to, how much data to send at each send event, how many send events to generate and the rate at which to produce data from those events. Next, we manually add the MyApp Application to the source Node and explicitly call the Start and Stop methods on the Application to tell it when to start and stop doing its thing. We need to actually do the connect from the receiver point-to-point NetDevice drop event to our RxDrop callback now. It should now be obvious that we are getting a reference to the receiving Node NetDevice from its container and connecting the trace source defined by the attribute “PhyRxDrop” on that device to the trace sink RxDrop. Finally, we tell the simulator to override any Applications and just stop processing events at 20 seconds into the simulation. Recall that as soon as Simulator::Run is called, configuration time ends, and simulation time begins. All of the work we orchestrated by creating the Application and teaching it how to connect and send data actually happens during this function call. As soon as Simulator::Run returns, the simulation is complete and we enter the teardown phase. In this case, Simulator::Destroy takes care of the gory details and we just return a success code after it completes. Since we have provided the file fifth.cc for you, if you have built your distribution (in debug mode since it uses NS_LOG – recall that optimized builds optimize out NS_LOG) it will be waiting for you to run. Now edit up “cwnd.dat” in your favorite editor and remove the waf build status and drop lines, leaving only the traced data (you could also comment out the TraceConnectWithoutContext("PhyRxDrop", MakeCallback (&RxDrop)); in the script to get rid of the drop prints just as easily. In the previous section, we showed how to hook a trace source and get hopefully interesting information out of a simulation. Perhaps you will recall that we called logging to the standard output using std::cout a “blunt instrument” much earlier in this chapter. We also wrote about how it was a problem having to parse the log output in order to isolate interesting information. It may have occurred to you that we just spent a lot of time implementing an example that exhibits all of the problems we purport to fix with the ns-3 tracing system! You would be correct. But, bear with us. We’re not done yet. One of the most important things we want to do is to is to have the ability to easily control the amount of output coming out of the simulation; and we also want to save those data to a file so we can refer back to it later. We can use the mid-level trace helpers provided in ns-3 to do just that and complete the picture. We provide a script that writes the cwnd change and drop events developed in the example fifth.cc to disk in separate files. The cwnd changes are stored as a tab-separated ASCII file and the drop events are stored in a PCAP file. The changes to make this happen are quite small. Let’s take a look at the changes required to go from fifth.cc to sixth.cc. Open examples/tutorial/sixth.cc in your favorite editor. You can see the first change by searching for CwndChange. You will find that we have changed the signatures for the trace sinks and have added a single line to each sink that writes the traced information to a stream representing a file. This illustrates that the Ptr<OutputStreamWrapper> is really just carrying around a std::ofstream for you, and you can use it here like any other output stream. In the first section of the code snippet above, we are creating the ASCII trace file, creating an object responsible for managing it and using a variant of the callback creation function to arrange for the object to be passed to the sink. Our ASCII trace helpers provide a rich set of functions to make using text (ASCII) files easy. We are just going to illustrate the use of the file stream creation function here. The CreateFileStream function is basically going to instantiate a std::ofstream object and create a new file (or truncate an existing file). This std::ofstream is packaged up in an ns-3 object for lifetime management and copy constructor issue resolution. We then take this ns-3 object representing the file and pass it to MakeBoundCallback(). This function creates a callback just like MakeCallback(), but it “binds” a new value to the callback. This value is added as the first argument to the callback before it is called. Essentially, MakeBoundCallback(&CwndChange, stream) causes the trace source to add the additional “stream” parameter to the front of the formal parameter list before invoking the callback. This changes the required signature of the CwndChange sink to match the one shown above, which includes the “extra” parameter Ptr<OutputStreamWrapper> stream. creates a PCAP file named “sixth.pcap” with file mode “w”. This means that the new file is truncated (contents deleted) if an existing file with that name is found. The final parameter is the “data link type” of the new PCAP file. These are the same as the PCAP library data link types defined in bpf.h if you are familiar with PCAP. In this case, DLT_PPP indicates that the PCAP file is going to contain packets prefixed with point to point headers. This is true since the packets are coming from our point-to-point device driver. Other common data link types are DLT_EN10MB (10 MB Ethernet) appropriate for csma devices and DLT_IEEE802_11 (IEEE 802.11) appropriate for wifi devices. These are defined in src/network/helper/trace-helper.h if you are interested in seeing the list. The entries in the list match those in bpf.h but we duplicate them to avoid a PCAP source dependence. A ns-3 object representing the PCAP file is returned from CreateFile and used in a bound callback exactly as it was in the ASCII case. The underlying objects are entirely different. For example, the Ptr<PcapFileWrapper> is a smart pointer to an ns-3 Object that is a fairly heavyweight thing that supports Attributes and is integrated into the Config system. The Ptr<OutputStreamWrapper>, on the other hand, is a smart pointer to a reference counted object that is a very lightweight thing. Remember to look at the object you are referencing before making any assumptions about the “powers” that object may have. that this object is not an ns-3 Object at all, it is “merely” a C++ object that happens to support intrusive reference counting. The point here is that just because you read Ptr<something> it does not necessarily mean that something is an ns-3 Object on which you can hang ns-3 Attributes, for example. you will see the same messages appear as when you ran “fifth”, but two new files will appear in the top-level directory of your ns-3 distribution. Since “sixth.cwnd” is an ASCII text file, you can view it with cat or your favorite file viewer. You have a tab separated file with a timestamp, an old congestion window and a new congestion window suitable for directly importing into your plot program. There are no extraneous prints in the file, no parsing or editing is required. Since “sixth.pcap” is a PCAP file, you can fiew it with tcpdump. You have a PCAP file with the packets that were dropped in the simulation. There are no other packets present in the file and there is nothing else present to make life difficult. The ns-3 trace helpers provide a rich environment for configuring and selecting different trace events and writing them to files. In previous sections, primarily Building Topologies, we have seen several varieties of the trace helper methods designed for use inside other (device) helpers. There are currently two primary use cases of the tracing helpers in ns-3: device helpers and protocol helpers. Device helpers look at the problem of specifying which traces should be enabled through a (node, device) pair. For example, you may want to specify that PCAP tracing should be enabled on a particular device on a specific node. This follows from the ns-3 device conceptual model, and also the conceptual models of the various device helpers. Following naturally from this, the files created follow a <prefix>-<node>-<device> naming convention. We use an approach called a mixin to add tracing functionality to our helper classes. A mixin is a class that provides functionality when it is inherited by a subclass. Inheriting from a mixin is not considered a form of specialization but is really a way to collect functionality. The class PcapHelperForDevice is a mixin provides the high level functionality for using PCAP tracing in an ns-3 device. Every device must implement a single virtual method inherited from this class. You can enable PCAP tracing on a collection of node/net-device pairs by providing a NodeContainer. For each Node in the NodeContainer its attached NetDevices are iterated. For each NetDevice attached to each Node in the container, the type of that device is checked. For each device of the proper type (the same type as is managed by the device helper), tracing is enabled. You can enable PCAP tracing on the basis of Node ID and device ID as well as with explicit Ptr. Each Node in the system has an integer Node ID and each device connected to a Node has an integer device ID. Finally, you can enable PCAP tracing for all devices in the system, with the same type as that managed by the device helper. The class AsciiTraceHelperForDevice adds the high level functionality for using ASCII tracing to a device helper class. As in the PCAP case, every device must implement a single virtual method inherited from the ASCII trace mixin. The first four methods also include a default parameter called explicitFilename that operate similar to equivalent parameters in the PCAP case. In this case, no trace contexts are written to the ASCII trace file since they would be redundant. The system will pick the file name to be created using the same rules as described in the PCAP section, except that the file will have the suffix .tr instead of .pcap. In this case, trace contexts are written to the ASCII trace file since they are required to disambiguate traces from the two devices. Note that since the user is completely specifying the file name, the string should include the ,tr suffix for consistency. This would result in a number of ASCII trace files being created, each of which follows the <prefix>-<node id>-<device id>.tr convention. You can enable ASCII tracing on a collection of (node, net-device) pairs by providing a NodeContainer. For each Node in the NodeContainer its attached NetDevices are iterated. For each NetDevice attached to each Node in the container, the type of that device is checked. For each device of the proper type (the same type as is managed by the device helper), tracing is enabled. This would result in a number of ASCII trace files being created, each of which follows the <prefix>-<node id>-<device id>.tr convention. Combining all of the traces into a single file is accomplished similarly to the examples above. Several of the methods have a default parameter called explicitFilename. When set to true, this parameter disables the automatic filename completion mechanism and allows you to create an explicit filename. This option is only available in the methods which take a prefix and enable tracing on a single device. The class PcapHelperForIpv4 provides the high level functionality for using PCAP tracing in the Ipv4 protocol. Each protocol helper enabling these methods must implement a single virtual method inherited from this class. There will be a separate implementation for Ipv6, for example, but the only difference will be in the method names and signatures. Different method names are required to disambiguate class Ipv4 from Ipv6 which are both derived from class Object, and methods that share the same signature. You can enable PCAP tracing on the basis of Node ID and interface as well. In this case, the node-id is translated to a Ptr<Node> and the appropriate protocol is looked up in the node. The resulting protocol and interface are used to specify the resulting trace source. Finally, you can enable PCAP tracing for all interfaces in the system, with associated protocol being the same type as that managed by the device helper. Implicit in all of the method descriptions above is the construction of the complete filenames by the implementation method. By convention, PCAP traces taken for devices in the ns-3 system are of the form “<prefix>-<node id>-<device id>.pcap”. In the case of protocol traces, there is a one-to-one correspondence between protocols and Nodes. This is because protocol Objects are aggregated to Node Objects. Since there is no global protocol id in the system, we use the corresponding Node id in file naming. Therefore there is a possibility for file name collisions in automatically chosen trace file names. For this reason, the file name convention is changed for protocol traces. The class AsciiTraceHelperForIpv4 adds the high level functionality for using ASCII tracing to a protocol helper. Each protocol that enables these methods must implement a single virtual method inherited from this class. In this case, trace contexts are written to the ASCII trace file since they are required to disambiguate traces from the two interfaces. Note that since the user is completely specifying the file name, the string should include the “,tr” for consistency. You can enable PCAP tracing on the basis of Node ID and device ID as well. In this case, the node-id is translated to a Ptr<Node> and the appropriate protocol is looked up in the node. The resulting protocol and interface are used to specify the resulting trace source. Finally, you can enable ASCII tracing for all interfaces in the system, with associated protocol being the same type as that managed by the device helper. ns-3 includes an extremely rich environment allowing users at several levels to customize the kinds of information that can be extracted from simulations. There are high-level helper functions that allow users to simply control the collection of pre-defined outputs to a fine granularity. There are mid-level helper functions to allow more sophisticated users to customize how information is extracted and saved; and there are low-level core functions to allow expert users to alter the system to present new and previously unexported information in a way that will be immediately accessible to users at higher levels.